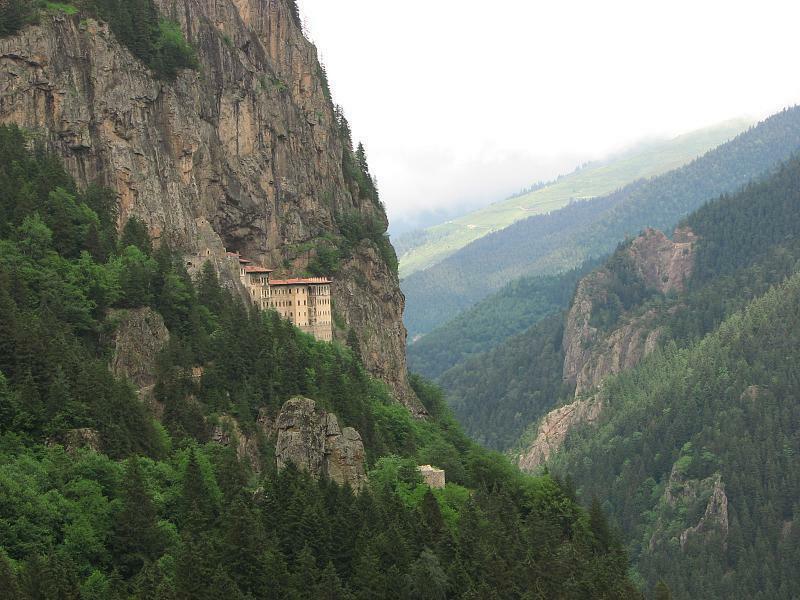 The above Photograph of the Sumela Monastery, Trabzon Mountains, former Pontus, by reibai of Flickr under Creative Commons Licence. Close to the home of my nearest recorded Big Y cousins today. The FTDNA results came back. As with the Y111 test results, they were three weeks earlier than scheduled. So what has this test told me, about the story of my Y-DNA, and it's exotic L-M20 genetic marker? It was not a disappointment. Remember, I am only telling the story of one single line of descent. Y-DNA merely provides a convenient genetic marker of mutation, that can be compared and traced with others. It does not define anyone. From an anthropological perspective, haplogroups are of value in a collective sense - to a population. I no doubt share the story of my Y with many more people alive today. I may be a carrier of it, but it is also your story, just as the haplogroups that you carry, are also my story - through our mothers and shared descent. Y-DNA passes strictly on only one line of descent - from father to son. It is not inherited nor passed down by women. Only on that one strict paternal line of descent. 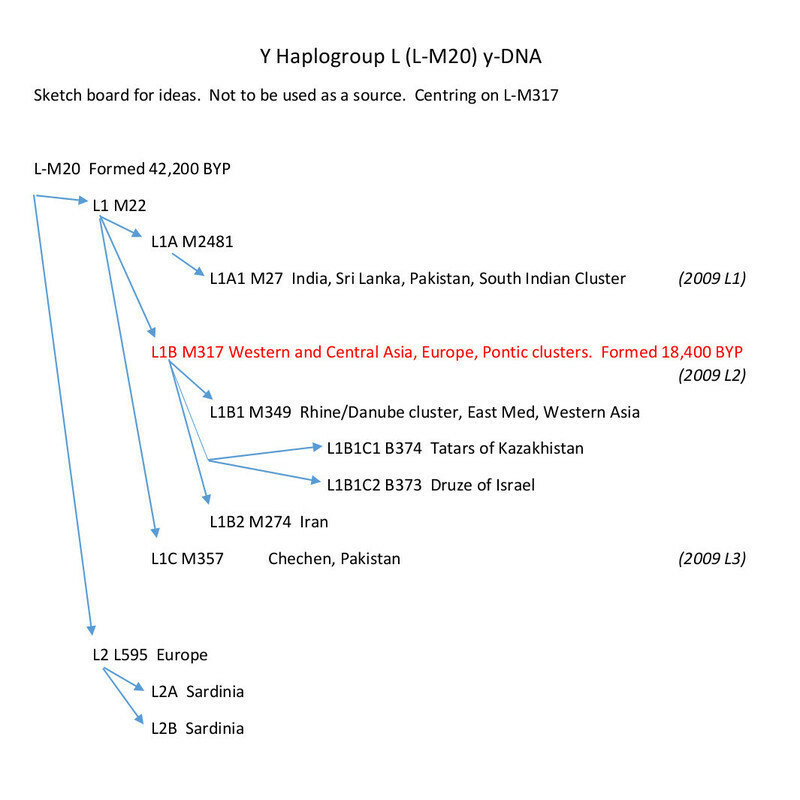 The Y haplogroup is only a convenient marker of one line. Y Haplogroup K formed in a paternal lineage of hunter-gatherer fathers and sons, that share a MRCA (most recent common ancestor) during the Upper Palaeolithic, circa 45,400 years ago. Where did my Y ancestors live at that time? We think that they lived in Western or Southern Asia. Iran is a favourite proposal. My earlier Y ancestors had most likely exited Africa 20,000 years earlier, and were well established in Asia. They had most likely met and confronted another archaic human species, The Neanderthal. This was however, a time of great expansion by humans. The first anatomically modern humans had recently entered Europe, while other moderns u were arriving in Australia. The Ice Age was in a flux, but glaciation was advancing. Our most recent common Y ancestor to carry Y Haplogroup LT lived circa 42,600 years ago. Then a mutation in the Y-DNA lead to the formation of Y Haplogroup L, with a most recent common ancestor 23,200 years ago, close to the time of the Last Glacial Maximum, when ice sheets were reaching their maximum positions. K, LT, and early L, most likely all originated in Upper Palaeolithic hunter-gatherer populations living during the last Ice Age, in the area of modern day Iran and Iraq. It was a time of increased stress on human populations, that were having to adapt to some severe environmental challenges, and may have at times faced isolation into a number of Ice Age Refuges. Around 18,400 years ago, M317 appeared on their Y-DNA, then circa 14,000 years ago, my line (L-SK1214), diverged away from L-M349. L1b today, occurs mainly in Western Asia, from Anatolia to Afghanistan. L1a occurs mainly in India, Sri Lanka, and in Pakistan. Where did all of this occur? We don't know yet. There is so little data. Some other divergences popped up in Southern and Central Asia. Some of these sub clades in India and Pakistan, are the most numerous of L today. However, the finger keeps pointing at Western Asia, as the source of much of L divergence, particularly in L1b sub clades such as M317, and M349. But we don't yet know what part Europe played if any. Both M317 and M349 crops at low frequencies across Europe, particularly along the south coast, and in Italy. L2 (L595) crops at at low frequency almost exclusively in Europe. Altogether, L forms only around 0.3% across Europe as a whole, yet, this diversity sits at low frequencies scattered across the continent. Iran may equally be a key. We believe that it could have been home to L for a very long time, but we have very little data from that part of the world. L is also missing from ancient DNA. A hypothesis has been proposed that some early Neolithic farmers from Anatolia, may have carried L, and may have carried it into Europe for example. All speculation, but it could explain some of these old divisions of L that we are starting to see across Europe and Western Asia. Some of the earliest Eurasian L Y-DNA extracted so far has only very recently been reported - in populations of Iron Age Huns, that had migrated westwards into Europe. So what did the test tell me about my line? Was I descended from a recent immigrant from India or Pakistan? An Iron Age Hun? An Italian? How about a Pontic Greek, or a Persian? Where do I fit in? The answers provided by the Big Y were a bit of a shock. I had 90 novel SNPs in my Y-DNA, that have not been seen before in any other Big Y Test, not even in any of the other 23 Big Y test results within the FTDNA Y Haplogroup L project. The last SNP to terminate, that has already been reported, was SK1414. The administrator has not yet found it's non-FTDNA origin, but believes that it came from a test in Iran. Therefore, my sub clade can now be declared as L-SK1214. My nearest FTDNA Big Y matches were two from Pontic Greek ancestry. However, here is the crunch. The project administrator calculates that even these testers, my closest known Y cousins that have so far tested to Big Y level, last shared a common Y ancestor with me 13,000 years ago. When I have my BAM file, and submit it to the Yfull tree, it should make a significant alteration to the branches, as my lineage of SK1414, appears to branch off from L1b, perhaps only 1000 years after L1b appeared, and before the PH8 lineage associated with my Pontic Greek cousins formed. So my new terminal SNP SK1414 separated from the Pontic Greek PH8 lineage around 13,000 years ago. What was happening in Western Asia then? This was towards the end of the last Cold Stage. There were some cold fluctuations in the Ice Age climate, with some advances in glaciation, before they finally started to melt back for the present interglacial period. Perhaps some of these climatic stresses were involved? a severe freeze took place around 12,700 years ago. My most recent common ancestors to any other Big Y testers - the Pontic Greek samples, lived somewhere in Western Asia around 13,000 years ago. They most likely were Western Asian ibex hunter-gatherers. The earliest sign of agriculture in the region, the Pre Pottery Neolithic A doesn't take off until around 10,300 years ago. Where have my Y ancestors been over the past 13,000 years? That is the big question that I am probably unlikely to answer within my lifetime. More testing, by more L testers in the future may reveal more, as would the results of more ancient DNA from excavations. If I had to bank money on it, I'd say that my Y ancestors were most likely to provenance to the Fertile Crescent of the Neolithic Revolution. Perhaps in the river valleys of Iraq / Iran. They may have gone on to take part in the Pre Pottery Neolithic A Culture there. That might account for their existence over the next few thousands of years. However, when did my lineage enter Europe? Did it arrive with Anatolian Early Neolithic farmers? Or did it arrive later? Perhaps even, much later? I just cannot answer that. Suggestions are most welcome. 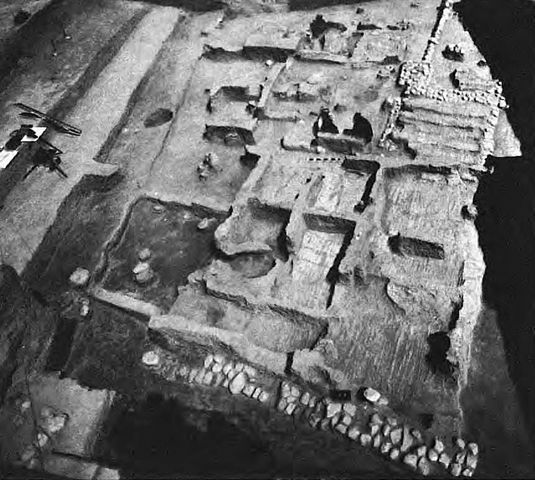 The above photograph taken of the excavation of Jarmo, an Early Neolithic village in Iraqi Kurdistan, dated to 9,100 years before present. From Wikimedia Commons by user Emrad284. The STR testing, and the matching with the Chandler family might suggest that my Y line arrived in Southern England quite recently, perhaps during the Medieval. However, I am acutely aware of how very few English have yet tested - that more L could turn up, that rewrite that arrival date. It seems that I have 12,700 years of unwritten or detected family history to research on my paternal line. The Big Y test told me that I have a hunter-gatherer ancestor, somewhere in Western Asia, most likely Iraq / Iran, perhaps 13,000 years ago. Then a rather long gap, until the Brooker surname appears on parish registers in the Thames Valley of Southern England, leading down to myself, and onto my son. The Chandler family, judging by the comparative STR evidence, are Y cousins, with a shared Y ancestry until circa 330 - 700 years ago. That's it. We were missing for a long time. I'm looking forward to trying to work out where my missing ancestors were for thousands of years. I'm looking forward to seeing more L1b tests appear on Yfull and on the Y haplogroup L Project. Please test. The above photograph on Rock Art in Iran, taken by dynamosquito on Flickr linked here under a Creative Commons Licence. 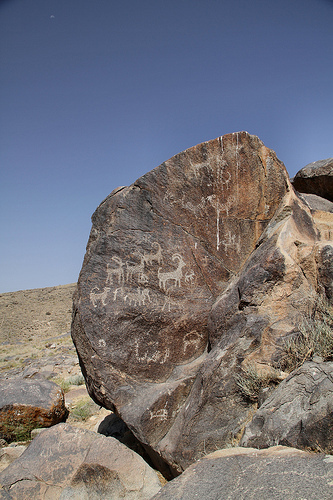 The Ibex seems to feature frequently in prehistoric rock art in the region, and perhaps was a primary prey of our ancestors. 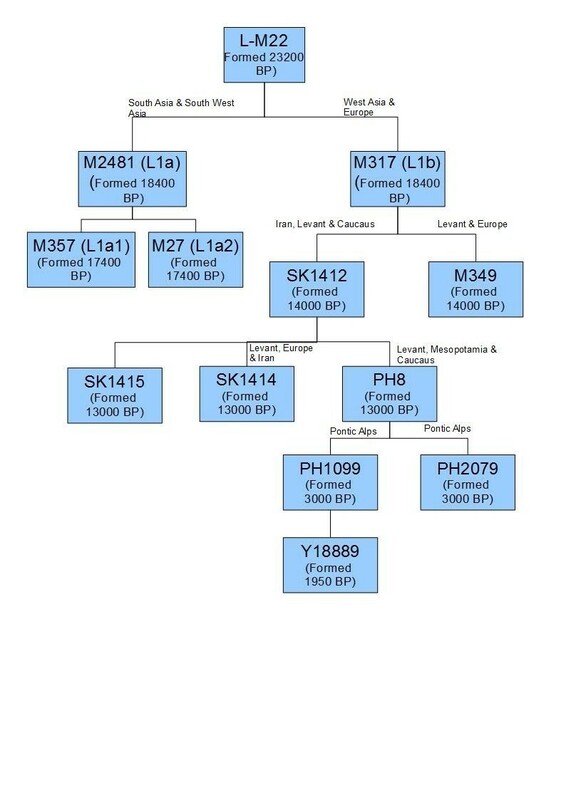 How did our family inherit a Y haplogroup L1b? I've inherited from my father, a yDNA haplogroup of L1b M317. Not a haplogroup ordinarily even regarded as European. It's not particularly common anywhere, but of such low concentrations in North-west Europe, that it doesn't even appear on our haplogroup maps or tables. Closely related L1a is concentrated in India, while L1c is concentrated around Pakistan. But our sub clade L1b, has it's main concentration in Western Asia, south of the Caucasus. 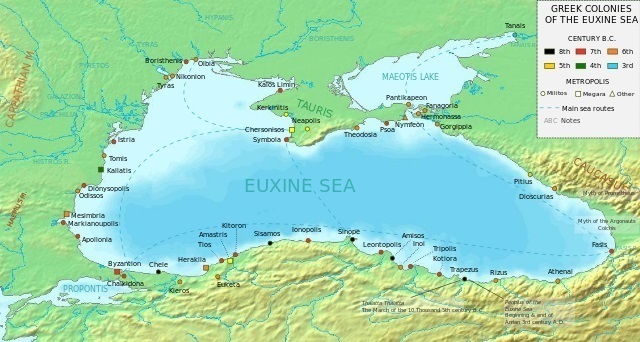 It has been found for example in higher concentrations, in the Pontic Greek community that lived in Pontus, North East Anatolia, on the coast of the Black Sea. I'm currently investigating the yDNA further with STR testing. Unless the haplogroup was passed into our family at some point, via a non-paternal event, it should follow my surname line, which I've traced back to a John Brooker who fathered children in Oxfordshire during the early 19th Century. The surname itself is certainly English. It clusters in a few places in England - particularly in Kent / Sussex, although our family surname appears to have originated with a smaller cluster in the Oxfordshire / Berkshire area of England. So how did we end up with an East Anatolian Y?
" ... it is surprising to find the haplogroup A1a (M31) in a family of the Yorkshire surname Revis. This haplogroup is close to the root of the human family tree and rare even in Africa. Genealogical detective work established that the Revis males who carried A1a fitted onto two family trees going back to the 18th century in Britain. A paper trail to a common ancestor could not be found, but genetically he can be deduced a few generations earlier. How A1a arrived in Yorkshire remains a mystery. As Turi King and her colleagues point out, it could have come via a round-about route and not carried direct from Africa.22T.E. King et al., Africans in Yorkshire? The deepest-rooting clade of the Y phylogeny within an English genealogy, European Journal of Human Genetics , vol. 15 (2007), pp. 288–293; G. Redmonds, T. King and D. Hey, Surnames, DNA and Family History (2011), p. 201-204. A possible clue is that the surname Revis is derived from Rievaulx.23P.H. Reaney and R.M. Wilson, Oxford Dictionary of English Surnames , 3rd edn., revised (1997). In 1301 a William de Ryvaus was the wealthiest taxpayer in Marton, North Yorkshire, about six miles from Rievaulx, and a man of the same name paid tax in Gisburne (Guisborough) about 12 miles north of Rievaulx, while a William de Ryvauxe was the sole taxpayer for Barnaby, in the parish of Guisbrough.24 Yorkshire Lay Subsidy - 30 Ed. I (1301) , ed. W. Brown, Yorkshire Archaeological Society Record Series, vol. 21 (1897), pp. 32, 43 bis, 45. Rievaulx was a Cistercian Abbey in medieval times, founded from Clairvaux in France, and part of an Order with houses in Spain and Portugal built on land won from the Moors. No doubt genetic traces were left in Iberia of the Moorish centuries. A1a is not the most likely haplogroup to be among them, but perhaps not completely impossible. Master masons and other useful craftsmen could have been recommended by one monastic house to another in the Order. So we can dimly see one possible route from Africa to Yorkshire." As for how our y-DNA may have arrived in Southern Britain, I can imagine a number of scenarios. There is the early Neolithic hypothesis, that Y haplogroup L1b may be a remnant survivor of early European populations that had settled Europe before they were largely displaced during the Bronze Age, by DNA from the Eurasian Steppes. But if that were the case, I'd expect it to be less rare. L1b is scattered in low frequencies across Italy, and along the South European coast of the Mediterranean. 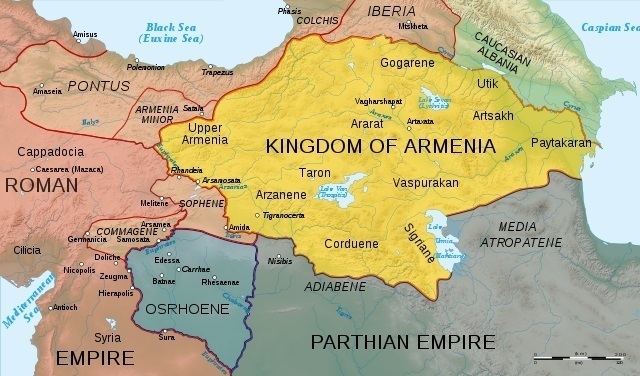 For that reason, it may be that it arrived here, or gradually made it's way across the Continent via the Roman or later Byzantine Empires, from Pontic Greek communities. That is one possible route. In addition to these M-317's, there is the Pontic Cluster (L-PH8 (FTDNA L-M317) YCAii = 17-21) of 56 individuals, many only low level STR tested to predict L-M20. Some of them however, are tested down to M317. They are mainly in Turkey, Georgia, Iraq, and Greece. One however, was in Germany (surname Stiffler). Where will our L-M317 fit in? Which of these will turn out to be my nearest cousins?